A couple of days ago my parents paid me a visit. And, of course knowing their oldest son's favourite interest, they brought along a videocassette. On it was an episode of Antikrundan, a Swedish TV-program where experts on antiques travel around the country and estimates the value of old thing people bring them. In this particular episode, a guy showed one of the experts a reproduction of a painting of Elvis signed by the King himself. Turned out the guy's aunt thought Elvis was so great that she traveled from Sweden to Memphis in 1963 and lived there for a year. Unfortunately the antique expert didn't seem too impressed by her time around Elvis, and instead concentrated on the signature, which he claimed was indeed Elvis's. His explanation for this was that the P and the R in Presley had some space between them, something a forger often misses. Don't know anything about that, but the expert also showed the signature of the painter in the lower left corner, June Kelly. He then went on explaining that she painted pictures of Elvis which during the 60's were printed and given away with the purchase of some of his records. Unfortunately the guy and his brother used a water pistol on the painting when they were young, so it had some spots on Elvis jacket. Otherwise, it looked fine to me, and so thought the expert who told the owner that a collector would pay between 10 000 and 15 000 Swedish crowns, about $1 600 – $2 500. 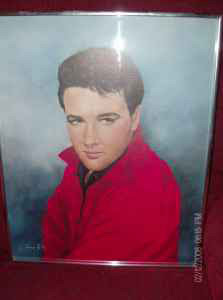 Turned out he was right on the money, when I searched the Internet I found a copy of exactly the same painting also signed by Elvis, which had sold for $2 500. (you can find it a bit down on this list). Finally, if you want to see the episode I've just described yourself (and hear what Swedish sounds like) click here and start 42 minutes and 50 seconds into the program. Not that I was particulary intersted in reading that George Klein have in his possesion a tape with three duets recorded at about the same time as the rest of the Guitar Man sessions from 1980. Nor was I surprised to see that Sony BMG have the tapes also. 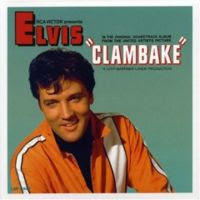 Still, it influenced my choice of which Elvis record to play last night. And as I listened to the tracks on the FTD release Too Much Monkey Business I once again was reminded that Felton Jarvis picked the best of these re-recordings for the Guitar Man LP back in 1981. As you all know, these songs are very controversial among the fans. I for one think some of them are quite good. The titel song "Guitar Man" can surely hold its own as can "Too Much Monkey Business." I also like "Lovin' Arms," with its superb female backing vocals. But some of the previously unreleased material featured on the FTD CD is donwright awful. "In The Ghetto" is completely ruined and the same goes for "Long Black Limousine." "Blue Suede Shoes" is nothing less than a disaster. "Burning Love" has some potential, though. I remember hearing the remake of "Guitar Man" on the radio back in the early 80's and wondering if Elvis really sang "What'd I Say" at the end or if it was some kind of mix. It was great hearing the original unedited master in 1994 on the 60's box set and discovering the truth. Ironically, the problem with the Guitar Man sessions is that the songs sound more dated in their re-recorded form. To me, that's another proof of how timeless Elvis music is and why it's still so popular today. A final thought on the subject: I've always wondered what the musicians thought of these sessions. Here were people who had recorded with the real Elvis and now they got to play only together with his voice. Must've been a strange experience. Nearly forgot; you must watch this video featuring "Guitar Man" à la Felton Jarvis together with footage from the '68 Comeback Special. It's really great. As my wife's from Chile, for some time I've tried to learn some Spanish. This last year I've been pretty serious about it, even taking evening classes at college. Getting tired poring over my textbook, I decided to do some alternative studying and tried to translate the lyrics to "Guadalajara" from Fun In Acapulco. Turned out that move wasn't too good for my self-confidence. The first two lines I translated to something like "You have the provincial soul, you smell like a fresh early rose." But from there it went downhill with incomprehensible lines such as "to green woods, fresh from the river" and "thousand doves and your farm." It really made no sense at all so I called for help from my wife who speaks Spanish fluently. As it turned out she didn't recognise all of the words either! She told me it was kind of like translating a poem, which of course isn't an easy job. Can't have been easy for Elvis learning the song, either. A couple of years ago, when I proudly played it for my father-in-law he just laughed at it, and said he preferred "Don’t Be Cruel." At the time I couldn't judge Elvis performance from a Spanish point of view, but hearing it now and reading the lyrics at the same time, even to me it's pretty obvious the pronounciation leaves a lot to be desired. For example, the Spanish word "Sabes" (meaning "You know") sounds like "Some piece" which is a bit off the mark. But it's like someone commented on YouTube (in Spanish) where you can watch Elvis performance. "I'm very much Latin, and I think Elvis sings this Mexican song very professional. I take my hat off for Elvis Presley." Speaking of hats, the scene where Elvis sings "Guadalajara" must hold the record for most sombreros seen at the same time in a movie. And when they are all thrown in the air at the end it looks like Kelloggs Froot Loops! I'm not heavy into anniversaries (if they don't mean a new exciting Elvis release, that is!) But I just couldn't let it pass unnoticed that this is posting number 100 on my blog Elvis Today. When I started the blog August 16, last year, it wasn't because I wanted to write about news in the Elvis World. After all, a lot of sites were already doing that, and continue to do so very well. No, what I missed on the Internet were stories of a more personal nature, and therefore I thought it would be nice to share some of the experiences I have because of Elvis. Also, I saw, and still see it, as a way to express my opinions about records, movies, magazines and so on. At first, I felt the whole thing was kind of an experiment, as I didn't know for how long I would be able to come up with things to write about or if anyone was even interested in what I would have to say. Also, as I have found out along the way, it isn't always easy to find the time to sit down and write about my Elvis related experiences, but when I do I always enjoy it. And that's the thing that keep me going, the fun I have with Elvis Today. Also, it's a great feeling when some of you leave a comment now and then. To me, that's proof that my blog is being read by Elvis fans such as myself. Anyway, I stumbled across the top-notch Elvis Today blog while looking up info about another Elvis project, This Is Elvis. I watched the 1981 theatrical cut of this rockumentary for the first time in years the other day. Elvis Today is an extremely well-written blog. I was so thrilled to find it that I actually went back and read all 90 or so of its entries. I've not done this for any other blog out there, including the myriad of ones available for Star Trek (there are some Elvis connections there, too; I'll also save them for another day). Reading that one really made my day. Thank you, Tygrrius. 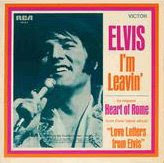 The first time I heard "I'm Leavin'" was on a 90 minutes cassette a classmate of mine gave me in the early 80's where he'd recorded songs from the Elvis Aron Presley box set. Kind of a "best of," if you'd like. From then on, the song has always been a favorite of mine, with its haunting quality and passionate performance by Elvis. That's why it was especially interesting reading an interview with Michael Jarrett, the guy who wrote the song, in the latest The Man And His Music magazine. Turns out he was fooling around with a guitar in the shower (good echo in there, obviously) and started singing the la la la's. Then the first verse "just happened...and I realised I was singing about this girl I'd left behind in Portland." Great stuff. When Michael Jarrett first heard Elvis version of "I'm Leavin'" on the radio he stayed up all night listening, as they played the song once an hour. "A tremendous thrill," as he puts it. Also, it must have been exciting for him to see Elvis singing the song in 1971 at the Hilton in Las Vegas: "He looked right at me and smiled and winked at me as he was singing my song. I got chills from head to toe." Well, I still get chills listening to "I'm Leavin'" and I'd like to think Jarrett would be pleased to know that, too. He really comes across as a nice guy in the interview. By the way, he also wrote "I'll Be Home On Christmas Day." Did you know that one was originally titled "It Happens Every Year?" Turned out impersonator Justin Shandor didn't look too much like the king, he was kind of shorter and heavier. But he sang very much like Elvis did, and at the end of the show he got standing ovations. That's about sums up yesterdays concert with Justin Shandor, Glen D. Hardin, some other American musicians and the Swedish Cadillac Band. The local theatre were they performed was about half full, but the audience enthusiasm more than made up for that. Justin did two sets, one as Elvis in the 50's and one as the Elvis we know from the the 70's. I think he did a better job as the early Elvis, maybe because he himself is so young. Also, that part was more fun as it's a bit more unusual seeing someone doing the 50's stuff like "Hound Dog" with the slow ending. That said, Justin Shandors impressive vocal range was more evident on the 70's material. No surprise then that he got standing ovations after "How Great Thou Art" and "Unchained Melody." It's always with mixed feelings I watch an impersonator. On the one hand is the (hopefully) close resemblance with the real thing, on the other the fact that no one can ever look or sound like Elvis because his style was unique. All in all, it was an enjoyable evening and Justin Shandor did a good job. But I have to admit, being there in the audience, I couldn't help longing to hear Elvis Presley sing. So today, I've been listening to a lot of Elvis records. There is only one original. PS: Glen D. Hardin seemed to be enjoying himself.